First of all, I apologize for length of this post. This is a topic that is major for me at the present time. I have done two pieces, the first one using the first two prompts and the second on the third. Both are digital using original artwork. Safe Haven uses a painting I did earlier in the year after a dream I had. I was very ill in hospital and had almost given up the fight, then I had this dream. I was in a forest it was very dark and frightening. Suddenly behind me was this man who looked like a hippie. “Follow me!” I followed, I was surprised that I did, because he looked a bit unsavoury, as the forest got lighter I noticed that he really was an ordinary person, just a dude I remember thinking. Then I started to notice that the trees and plants were a beautiful green, soon there appeared wonderful flowers, strange insects, and the colours were unbelievable. If I tried to paint or draw them you would have thought it was fantasy art. But it was real I could smell a wonderful perfume it was like a overdose of rose scents hitting you. Then we got to a wonderful glade with a pool and at the far end a waterfall. 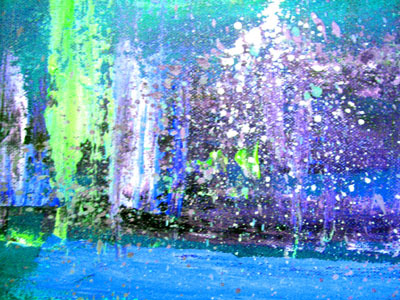 Again the colours were amazing, the abstract I painted doesn't do justice, but may give you an idea . There was a wonderful glow of golden light. I thought that perhaps I was tripping on the medication. It was so way out there. The man turned to me and he had a golden glow surrounding him. Then I just knew that he was Jesus. He said to me “You must never forget that I am here to carry you in times of need and suffering!” Then he took my hand and sat on the grass by the pool and hugged me. We sat there for a while then he got up and said, “Come here when you feel in need, I will be here, always.” He walked out on to pool and sorted of glided over the water and disappeared under the waterfall! When I woke up I knew I could lick this illness and I started to improve much to the amazement of the doctors and nurses. So now I always go to that glade when I am sick or in a bad place. I have never seen that man again, but I know if I needed him he would be there. So, that is the story behind the waterfall. When I saw the prompt for FFF I just knew I had to tell the story. So to illustrate it better I did the pencil drawing above and added it to the waterfall in Photoshop and lowered the opacity to give that dreamlike feel. I am really happy with the finished piece and am seriously considering painting a girls face on the waterfall painting but them maybe not! Maybe do a completely new painting? It actually fits for me to have that glade as a safe haven because all throughout my life, I have always had a spot in nature wherever I lived, where I could go and sort my head out. Where I am living at the moment I have a local lake I go to and commune with nature and God. The next piece is entirely digital, and it is something I have been working on for a few months. My friend and I are winding up our courage to have a joint exhibition next year at our local museum/art gallery that lets local artists exhibit their work in the large foyer. She is a photographer who uses digital processes to create a completely new work. I do a lot of digital work using original artwork. I have used the second prompt - the quote, which I feel fitted the picture. It is one of a series I am calling “Walk into the Light”. I only finished this one on Wednesday so even though I didn't start it with FFF in mind it fits the quote. I have been guilty (as many of us have, I am sure) of hiding behind a security blanket and not stepping out and using my talent because I didn't have faith in myself. I have always had excuses for not doing my art – need to work for the man to get money for the mortgage, my husband wants me to work, I not good enough, haven't the time, the list goes on and on. What art I did, I only let friends and family see, and quite often I burnt it with each move we made! As time went on, holes appeared in my secure world and I had to make the leap, and this is what the above work portrays. Me coming out of my fragile box into the light. However, I slightly disagree with the quote as I feel we need to have a “sheltering family tree” to go to when we need it. The tree is there to give us strength and grounding so we can go out in the sun and shine like stars that we all are. If you got this far well done! I am really interested to see what others have posted for this challenge. As this work has taken up most of my art time this week I am also posting it for Paint Party Friday..... Happy PPF and FFF. That's a wonderful dream Happy PPF! Beautiful textures created in your backgrounds. This is such a poignant post!! I believe you got an amazing message that thankfully you heeded!! I always felt as though I had a guardian from a very young child when I got myself up to go to church alone!! Love the colors and movement in that piece and enjoyed it even more with the story behind it!! I just altered some original art digitally this week too! I love digital!! The second piece is powerful...sad that we always put ourselves on the back burner for so many years! Now you have nothing to lose! Just get yourself and your art out there, if you truly want to! Great post, thanks for sharing so much of your intimate self!! Powerful post! Knowing the story behind your art makes it even more powerful for me. So glad he guided you back to health! Thank you for sharing this with Fall Fearless and Fly! Wonderful to see your paintings and read the stories behind them. They must be very special to you! Wonderful and interesting post, great to know the story behind your pieces. What an awesome dream! HPPF! fab work i really love that background. Love your post and your artwork! Your story resonates with me as my sister had a similar dream after being severely injured in a car accident when she was only five. The nurses were stunned to hear such a "big" story out of a little girl. Thanks for sharing your story with us. I like your colors and textures a lot. It's very interesting to see how you did the digital part of the artwork as well. Wow! I love how your dream guided you and healing took place immediately afterwards. The power of the soul, prayer, whatever...it worked. Glad you got the message and heeded it. And that it continues to be there for you when you need it. Both works are very moving...I must try digital art, the piece is so interesting. Sharon - thank you SO much for sharing all of this. I am so happy that Fall Fearless & Fly inspired you to tell this story. Both of these works are so moving. Happy PPF! Love the background on the first one. Thank you for sharing your story! How great to have this dream, and this place in your heart to go when things are in turmoil. Sharon, I read every word and was so touched by what you wrote. Now, is your time to shine. Your work is beautiful. I am so glad you are sharing it with the world. I am glad you are stepping into the light. It is so hard to do but the world is better when we create and share our art. Your work is beautiful. Happy PPF! With so much blue, it reminds me a bit of Picasso in his blue period. Really cool! The dream you had was very special, thank you for sharing it and your painting merged together perfectly. Good luck with the exhibition! Very inspiring post and artwork. I think it is so interesting to hear how the inspiration for a piece of art comes about.